Delivered to U.S. Army Air Force as 44-74813, 19??. Delivered to Royal Canadian Air Force as 9261. James Defuria/Fred Ritts/Intercontinental Airways, Canastota, NY, July 21, 1958. - Reported crashed, Canastota, NY, June 27, 1960. Aero Enterprises, Elkhart, IN, August 30, 1960. D.C. Mullery, Chicago, IL, November 1962-1966. Richard D. Burns, September 28, 1966-1987. - Collided with aircraft on take-off, Oshkosh, WI, July 29, 1978. Jack D. Rodgers, Rockford, IL, 1987-1989. Richard D. Burns, Hinsdale, IL, 1990-1992. Jack D. Rodgers, Chicago-DuPage, IL, June 1993-1996. 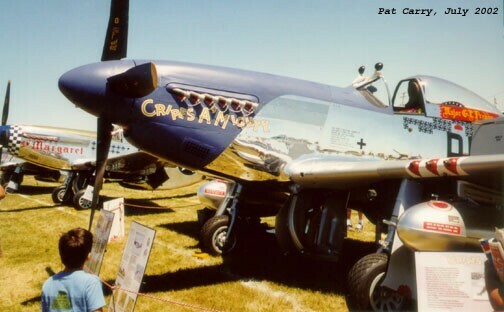 - Operated by Air Classics Aircraft Museum, DuPage, IL, 1995-1996. - Flew as 4-14906/Cripes A Might IV. Ken Wagnon, Wichita, KS, October 1996-1997. - Delivered to Danville, IL for restoration, October 1996. Ken Wagnon, Danville, IL, February 1997-2002. - Registered as N151KW, March 2001. - First flight, April 18, 2001. - Flown as 414906/PE-/P/Cripes a Mighty.